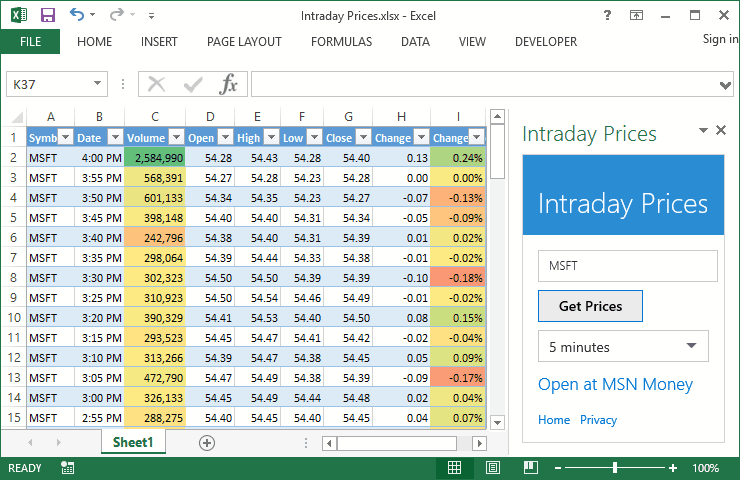 The add-in allows getting intraday stock prices of US and worldwide stocks from MSN Money into Microsoft Excel. Trade Period Combo Box Select a 5 or 15 minute period. Select the Intraday Prices app. The add-in loads source data from MSN Money. Other services are not used. MSN Money publishes 5-minute prices for the current day and 15-minute prices for the last five days. The add-in loads data from MSN Money directly. To find a ticker, you may click on the Open at MSN Money link. Then find a ticker and paste it into the ticker text box. The trial version shows 20 last rows only. The paid version shows all the data published: one day for 5 minutes and the last five days for 15 minutes.